On Sunday morning, we awoke fairly early so we could get a nice start to the day. We had hot showers in the refugio – I could get used to this style of “camping” in the future, before enjoying our delicious breakfast in the refugio of eggs, sausage and biscuits. 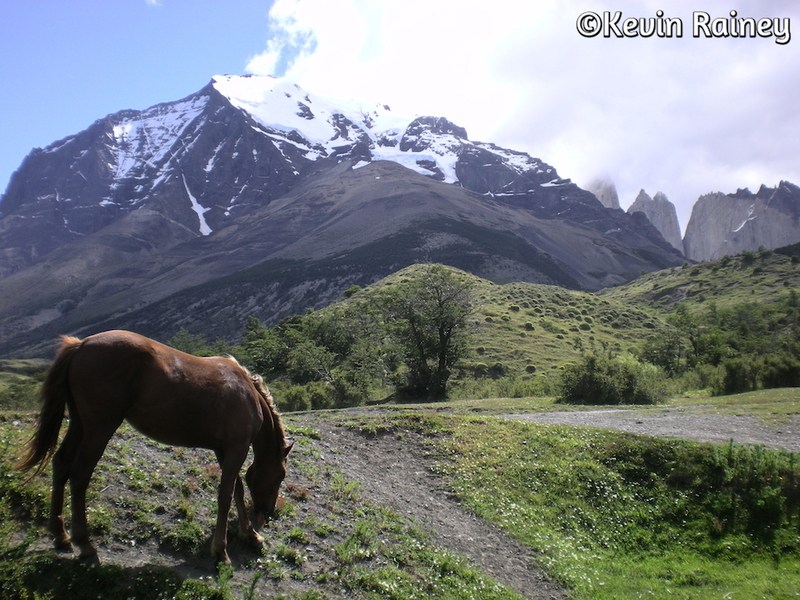 We left our large gear in our tents and headed up on our hike to the famous Torres, or towers. We crossed the river to the other side and hiked deeper up the valley. For a while the path followed the river before the trail turned abruptly and started a steep ascent. It could not be much further to the mirador, or overlook. That is what Jeff and I kept telling ourselves as we scrambled up what seemed to be an undeterminably long and difficult boulder field. For more than two and a half hours, we carefully climbed the steep, loose rock trail from refugio El Chileno. From the valley below, we caught a few obscurred glimpes of the world-famous torres, or towers composed of granite. They teased us to climb upwards, to experience their mountain high. As we pulled to the side to allow a Chilean girl to pass us on her way down, she stopped and broke into a large grin. She explained in Spanish that our effort would soon be rewarded. If there was one thing I had learned from hiking in Patagonia, it was to never ask the incredibly warm Chilean people any questions related to distance. Sometimes the answers would be intentionally rosy to encourage North American visitors, and afterall, my American mind just doesn’t work well in meters. Regardless, we knew we were close. Seemingly like an anchor, a 300-foot long boulder seemed to block our path above in the middle of the loose rock field. As I climbed to the left of the boulder, I watched my feet carefully on the loose rock. As I reached the top of the boulder, I turned my head upwards. My jaw dropped. It was one of those “pinch me” moments. Three granite spires shot several thousand feet into the air, as cirrus clouds from the Pacific rolled rapidly between the tops of their spires. Below them, an ancient glacier dropped its icy veil into a small tranquil lake no more than 500 feet straight in front of me. All the while, the sun shot through gaps in the clouds creating a dynamic fiesta of light and shadow that changed by the second. I grabbed my windproof jacket, reclined on a boulder and just stared at the spires for more than an hour. With hardly no other visitors, the tranquil spot was only interrupted by the unpredictable and fierce gust of the famous Patagonian winds. After taking a number of photos and feeling the cool water of the glacial pond, we knew we had to begin our descent. This was the first time we had ever had digital cameras and it was awesome to be able to actually see our photos before leaving such a monumental place! Jeff’s knee seemed to be doing well. I was worried he wouldn’t make it to the top, especially with the rock scramble. We took it slow and he never had the problem return today. After crossing the stream and arriving back at the refugio. We grabbed our gear from the tent and began the hike out to the end of the W circuit. We hiked up the steep valley before descending down the other side. Way down below us we had great views of Lago Nordenskiöld. As we continued descending, we thought we saw something moving around a bend ahead of us. They were wild Patagonia mustangs! Surprisingly they let us come right up to them and hike right by them. We made friends with a French girl from Lyon who took a number of photos of them – she was transfixed. She was backpacking South America by herself, but didn’t speak Spanish. We taught her a few words and she taught us some French as we hiked. We hiked together for quite a while before she stopped to filter some water. Jeff and I decided to go on because we needed to catch a certain bus out of the park to Puerto Natales. After arriving at the Hotel at the end of the hike, we saw some Americans and asked them where the bus pickup was. They said it was much further down the road. We told them about the French girl behind us and asked them to point her in the right direction. We hiked faster down the dusty gravel road questioning whether this was right. It turned out to be correct but several miles to the bus stop at Laguna Amarga. 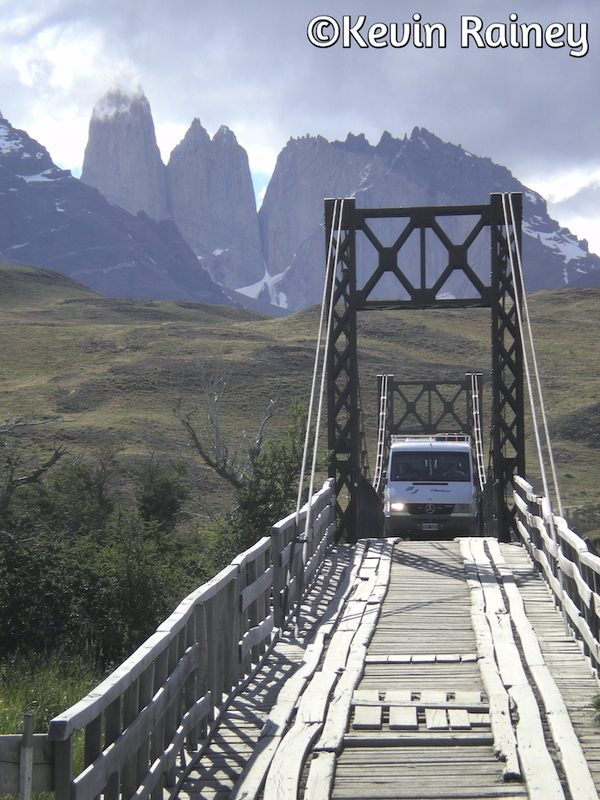 Along the way, we crossed a crazy narrow bridge and watched a Mercedes microbus gingerly cross a river as I took photos of it. After arriving at Laguna Amarga, we found out we had plenty of time. One Chilean guy was working at the ranger station and we talked to him in Spanish for a while about rock and roll and other interesting topics such as the dirty wars in Chile. We also bought some ice cream bars to enjoy while waiting on our bus. Not too long later, our Bus Fortaleza Aventura, arrived. We departed at about 6 p.m. and traveled along the shores of Lago Nordenskiöld before climbing some hilly terrain back outside of the park. We were worn out, but Torres del Paine lived up to be everything we thought it would be. Truly world-class trekking and some of the most beautiful terrain I have ever seen. I am not sure we have hiking infrastructure like this anywhere in the U.S. Upon our arrival back in Puerto Natales around 9 p.m., we checked back into the Darwin hotel and picked up our big bags. We had not taken everything with us. After dropping our gear off in our room and getting cleaned up, we went out for a great seafood dinner. We could stay up too late because we had another early bus in the morning. Thanks Nadine. 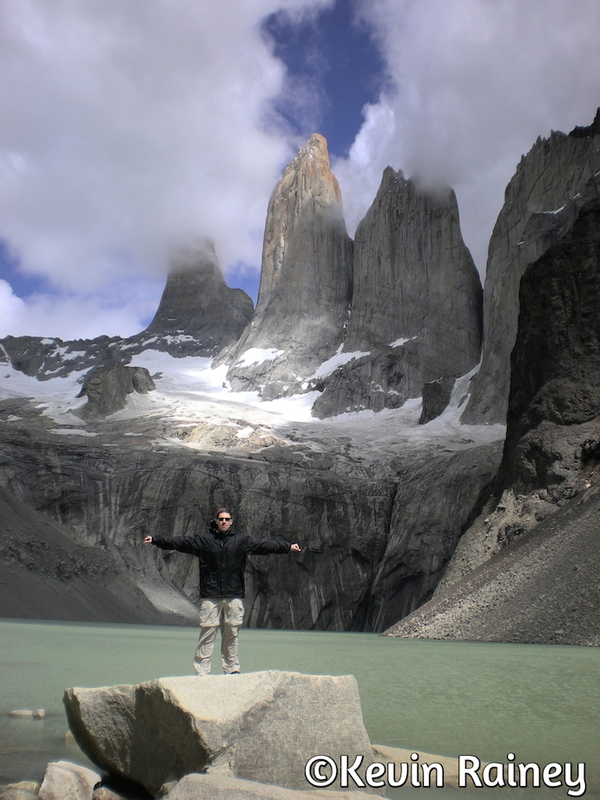 From reading your blog, I think Torres del Paine would suit your interests. It is considered one of the best trekking experiences in the world. The beauty of it is you can have a room, board (warm meals) and hot showers every night by staying in the refugios. It’s truly world-class hiking infrastructure with sights to rival anything in the Alps or New Zealand. The hiking difficulty was not too bad. The only part that was really strenuous was the hike from Refugio El Chileno to the Torres, which was basically a rock scramble at the end … not terribly steep, but loose rock. You probably wouldn’t have any troubles overall!